This very unique webbing was created especially for simplifying the appliqué process. One side of the web has a fusible coating and is applied to your fabric back. The other side has a light sticky coating, making your fabric moveable! Reposition your appliqué pieces as many times as you need. Once positioned, fuse into place and add your favorite decorative stitch! Use the tape-size version for quilt bindings or decorative trims. The convenient printable sheets make complex appliqué patterns a snap! Trim around the image, leaving at least ¼˝ inch of the Appli-Stick outside the traced lines. Fuse Appli-Stick to the wrong side of decorative fabric, using a medium/high temperature on your iron (no steam) ands firm pressure. The fusible side of Appli-Stick is the soft/shiny side. Hold the iron in place for at least three seconds, then flip the piece over and press again on the fabric side. After the piece has cooled, cut out the appliqué precisely using the traced lines. Peel back the protective sheet to expose the sticky surface of the appliqué. Position the appliqué piece on the base fabric or garment - reposition as many times as needed! Once the desired positions of all pieces are in place, use your iron to press and set the bond. Use a medium / high iron temperature and hold the iron to the appliqué for at least three seconds. *Press on the appliqué side and the fabric side for maximum bonding. Finish by stitching around the appliqué with a satin stitch or your favorite decorative stitch. Remember that the traced image will be reversed once it is transferred onto the paper side of Appli-Stick! Make adjustments to the original image if necessary. All irons heat differently. The iron temperature given above is a starting point. If you find that you are not getting a good fuse, slowly increase your iron temperature until you achieve a good bond. Also, remember to press from both sides of the appliqué and apply pressure with your iron! Test before beginning your project. 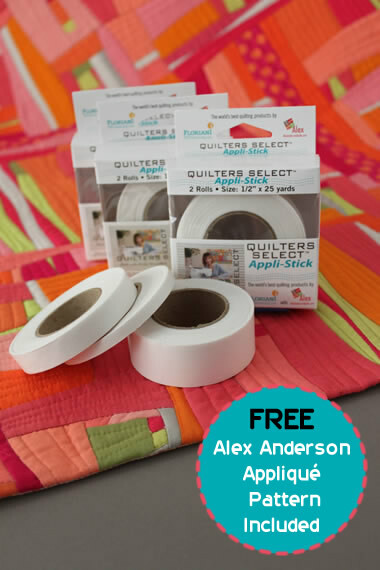 Use the convenient tape-size rolls of Appli-Stick to easily adhere quilt bindings or bias tape to the edges of quilts and home dec items! Eliminate pinning by fusing this repositionable tape to the back of decorative trims, piping, cording, zippers and more - Appli-Stick holds almost anything in place until you are ready to embellish! Appli-Stick also adheres to paper and wood! Use for scrapbooking, stickers, paper appliqué and more! Cool water and low drying temperature recommended. For delicate fabrics, using a pressing cloth is recommended.